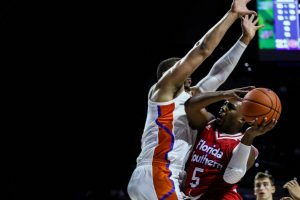 The Florida Southern men’s basketball team took on the University of Florida Gators on Oct. 30 in a pre-season exhibition game at the O’Connell Center in Gainesville, Fla. The Mocs fell into an early drought as the Gators were able to build a 20-point lead in the first 11 minutes. Southern was unable to close the gap for the rest of the first half and ended the half trailing the Gators with a score of 54-34. The second half started with Florida Southern eating away at the 20 point lead, but was never able to climb out of the early hole. 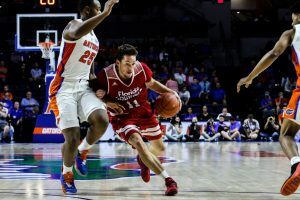 The Moccasins suffered a 95-70 loss against the Gators. Jonathan Lawton was named the Player of the Game, scoring 25 points for the Mocs, the highest amount of points by a player on either team. The Center for Student Involvement took 60 students on a “Pack the Bus” trip up to “The Swamp” to support the Mocs at no cost to the students. T-shirts were also given out to the students attending the game. The Moccasins have their first regular season game against West Alabama on Nov. 9 in the Jenkins Field House. The post Mocs fall to Florida Gators appeared first on the Southern.